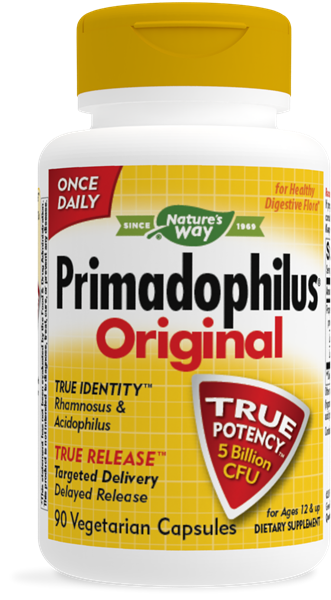 Primadophilus Original / 90 Vcaps - Nature's Way®. Probiotic capsules for ages 12+ with 5 billion CFUs & 2 strains of bacteria. Take 1 capsule daily. If pregnant, nursing, or taking any medications, consult a healthcare professional before use. Probiotic capsules for adults with 5 billion CFUs per capsule & 4 strains of bacteria. Chewable probiotic tablets for children 2+ years with 3 billion CFUs & 3 strains of bacteria.